Setup Linux BIND DNS server to work with Windows Active Directory. All you need to do is to allow updates from the active directory domain subnet and you’re good to go. Since this article involves more of Linux than Windows I’ve placed this article in the category Linux. First install a Windows Server OS and a Linux distribution, any Linux flavour will do. Install BIND DNS on the Linux server and do the necessary basic configurations. The IP prefix entered in the allow-update option represents the entire domain example.com, if your domain spans more than one subnet add those IP prefixes also. The same applies to the reverse DNS zone. In the above example my network part of the IP address is 192.168.0 hence the zone 0.168.192.in-addr.arpa Note that the zone files are stored in the slave folders. This is because when dynamic DNS updates are sent the named process creates temporary files in the directory of the zone file, so if you place the file in the usual location temporary files will not be created due to insufficient permissions. Our next step is to create the ddns directory inside the slaves directory to distinguish zone files acquiring dynamic DNS updates and create zone files inside them. Go to the Windows Server, open your network connection properties and enter the preferred DNS address as the address of the Linux DNS server. Go to Start -> run, enter dcpromo and hit enter. Follow the steps in the wizard, if you’re using windows server 2008 just uncheck DNS installation option and continue installation of Active Directory. 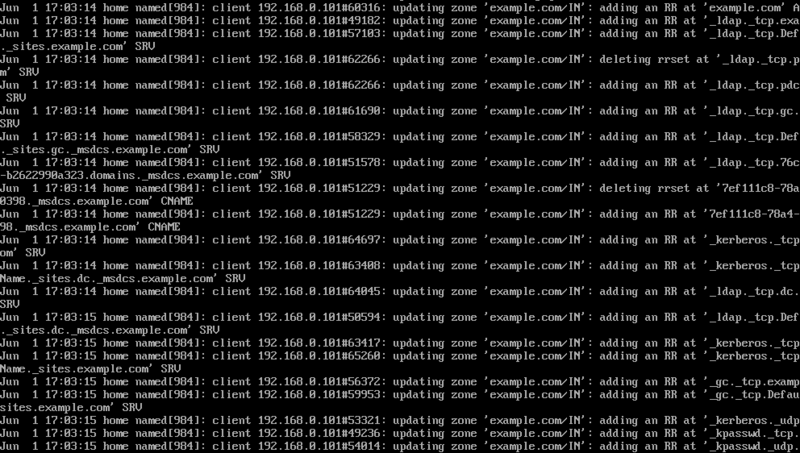 After the Windows server reboots check the /var/log/messages file in your Linux server you’ll see the updates that have taken place. Just remember to set the preferred DNS server of the client computers to the IP address of the Linux DNS server before joining them to the domain. why do you have those “BIND users” and “BIND chroot” there? what does it mean?